Starting with vSphere 5.5 there were several improvement in MSCS capability described in KB 2052238 (MSCS support enhancements in vSphere 5.5). But now there is also support for Windows 2012 R2 and SQL 2012, both in Failover Clustering and AlwaysOn Availability Groups configuration. Note that using clustering across physical hosts (CAB) with Physical Compatibility Mode RDM’s, the supported OSes are: Windows Server 2008, 2008 R2, 2012 and 2012 R2. Seems also that vCenter Server could be run on a FailOver Cluster (of course only the Windows version), but this must be confirmed in the final documentation. The new vSphere VM Component Protection (VMCP) is a way to protect VMs against storage connectivity failures and misconfigurations and was a big limit of previous version of VMware HA that was only able to detect network failure for hosts (and only on some networks). All Paths Down (APD): represents a transient or unknown accessibility loss or any other unidentified delay in I/O processing. This type of accessibility issue is recoverable. Permanent Device Loss (PDL): is an unrecoverable loss of accessibility that occurs when a storage device reports the datastore is no longer accessible by the host. This condition cannot be reverted without powering off virtual machines. Starting with vSphere 5.5 there where some big improvement on how handle APD and PDL, but still a host storage failure was a big issue. The simple solution was design the storage to don’t fail. There are detailed reporting of conditions and actions taken included impacted VMs, host(s) and datastore(s). 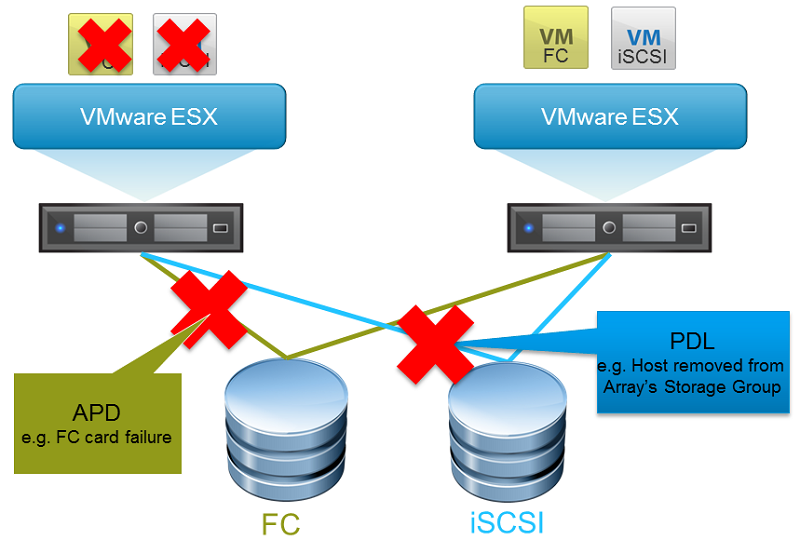 When a management network failure occurs for a vSphere HA cluster, a subset of the cluster’s hosts might be unable to communicate over the management network with the other hosts. Multiple partitions can occur in a cluster. A partitioned cluster leads to degraded virtual machine protection and cluster management functionality. Depending on where is vCenter Server and which hosts can be reach there are some cases explained in the Availability Guide. Also vSphere HA uses datastore heartbeating to distinguish between partitioned, isolated, and failed hosts. For more information see the related post. VMware ha rilasciato nuove patch per ambienti vSphere 4.1; per un dettaglio maggiore sui problemi risolti dalle nuove patch: http://kb.vmware.com/kb/2009080 http://kb.vmware.com/kb/2009137 Le patch di VMware ESX/ESXi sono disponibili per il download al sito: http://www.vmware.com/patch/download/ oppure possono gestite tramite VUM. #1 | Written by nikhil gupta about 4 years ago. #2 | Written by Marc Crawford about 4 years ago. #3 | Written by Yuri Mendoza about 4 years ago. It`s a great improvement, especially the detection of storage failures. And as nikil gupta pointed out, with the help of vRealize Operations you can be proactive with the different failures scenarios. #4 | Written by Mike M about 4 years ago. #7 | Written by Alex about 4 years ago. #8 | Written by Mohamed Ibrahem about 4 years ago. #9 | Written by Mohamed Ibrahem about 4 years ago. #10 | Written by Cris Rodriguez about 4 years ago. Thanks for the information good to know about how APD and PDL behave. #11 | Written by David Cain about 4 years ago. Good article, I hadn’t read about VMCP yet. Many thanks. #12 | Written by Andrea Mauro about 4 years ago. #13 | Written by Paulo Reis about 4 years ago. Using this new features, we can improve availability. #14 | Written by Scott Clark about 4 years ago. Looking forward to checking out VMCP. #15 | Pinged by vSphere 6.0 Link-O-Rama » Welcome to vSphere-land! about 4 years ago. #16 | Written by Nicholas Korte about 4 years ago. #17 | Written by Andres Rojas about 4 years ago. #18 | Written by Looneyduk about 4 years ago. #19 | Written by Syed Fayyaz Hussain Rizvi about 4 years ago. #20 | Pinged by [VMware] news + interesting reads from the blogosphere: 09 Feb 2015 about 4 years ago. #21 | Written by Alessandro about 4 years ago. #22 | Written by Rahim about 4 years ago. Great Article, haven’t read about VMCP before..
#23 | Written by Andrea Mauro about 4 years ago. #24 | Written by vervoort jurgen about 4 years ago. #25 | Written by Amit about 4 years ago. #26 | Written by Ravi Venkatasubbaiah about 4 years ago. #27 | Written by Mohammed Sadiq about 4 years ago. #28 | Written by Srujan about 4 years ago. Nice article with good information. Thanks. #29 | Written by Satish Kumar B about 3 years ago.